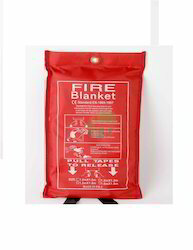 Fire blanket we are offering a world-class range of fire blankets, which is fabricated using imported fiber glass. Clients can avail from us, ceramic fiber blankets, aluminized glass fiber fabric, welding blanket with steel wire & various other types as well. We can also offer these blankets as per customers' requirements in special sizes. These blankets are highly useful for covering trapped person/items during rescue. Shiva Industries Offering a different varieties of Fire Blanket. The offered blanket is available in various sizes, patterns and design etc. It is widely used from protecting body from fire at bad conditions. Packaging Details: Attractive packing as per on customer demand. We are the leading manufacturer and supplier of all types of Fire Blanket. We have many devices to protect from fire fighting. Our products are available in the market at industry leading prices. besides, one can get these products at reasonable rates. Packaging Details: Good packing as per on customer demand. Looking for Fire Blanket ?